Important Note: Before we give the message the Lord gave us to present for this week, as a ministry and out of love and concern, we asked the Lord last night (May 11, 2014) to give a Word of encouragement for our brothers and sisters in Ukraine, given the turmoil they are facing right now. These precious people of Ukraine have been following the Lord’s teachings on this website quite faithfully and since they showed their willingness to learn from the Lord, He gave a vision depicting their relationship with Him and their spiritual condition. Please see the vision and illustration the Lord gave Charis in the last section of this article. Be blessed as you share and pray for them! The Lord told us this week to write on the above heading, and we will express it just as the Lord said. Let’s be honest with ourselves: we all think we can just use God whenever we urgently and desperately need a solution to a pressing problem, isn’t it? We want Him to work for our good while we just sit around enjoying the blessings; how cosy that would be! Well, this was the case when God gave Adam and Eve everything in abundance before they sinned (Genesis 1:28-30; 3:6-7). Soon after God’s Judgment of Adam and Eve and the earth, nature changed seasons and the abundant supply was cut off so man and animals and nature were subjected to want and decay (Genesis 3:17-19). The good news is that The Lord will once again introduce this model of perfect and non-decaying abundance in the already prepared New Jerusalem (Revelation 21:1-27; 22:1-5). However, in order for us to inherit this promised land overflowing with every good thing, incorruptible Kingdom of Heaven, we must be born-again and have faith, be obedient to the Lord and be fruit bearing (Matthew 6:33; John 3:3; Acts 16:31; John 15:4-6; 14:23; Galatians 5:22). The children of Israel in the Bible needed God only when the need arose, but soon after the Lord provided deliverance they returned to their idols and wicked ways (Judges 6:1-10; 10:10-17). The Lord is compassionate and full of grace, and if we humble ourselves and acknowledge our error He forgives us and provides deliverance for us (Psalm 103:12-13). There were also some of the Israelites who used God’s goodness for the wrong purpose; they had their livestock for meat (Exodus 12:38) but they craved other meat (Numbers 11:4-6). Likewise, King Saul wanted a dynasty for his kingdom and we know he wanted his son Jonathan to succeed him, but God would not allow it (1 Samuel 20:30-31). Saul wanted to use God for his own purpose (1 Samuel 15:30-31), but God made King Saul honour Him in the presence of the people and the elders of Israel. The key to Israel’s success and peace was rooted in their obedience to God’s word (Deuteronomy 28:1-5). Similarly, today many people, including Christians, need God only when things are going wrong in their lives. They go to the Lord and invoke God’s compassion while pleading for help. After they receive their blessings and deliverance, they return to their idols and wicked, lukewarm, and non-fruit bearing lives just as the Israelites did. Brethren, this is self-defeating because “…God is not mocked, for whatever one sow, that will he also reap” (Galatians 6:7 ESV). Being a member of the Body of Christ, by His grace the Lord has qualified me to speak to the body. The trend and practice in the church today is to pray for the needs of the needy and collect tithes, but without rebuking people about their sins. I have seen some pastors turning a blind eye to people’s sins; some are even allowed to serve at the altar while living in sin with their partners. I know this message does not make us popular; however it is not about me, but about Christ’s truth. Our aim is not to make a name for ourselves; we are not interested in anything of that sort, but only the truth of The Lord Jesus Christ. This truth is what brings joy and great pleasure to our lives! (Philippians 4:1). Like we mentioned in previous articles, we have had people contacting us to ask for a word for them from the Lord, and after the expected message was a word of correction, some would disappear. They expected the Lord to tell them about their ‘fortune’ in life and what they could get from Him. Let me put it this way, the LORD JESUS CHRIST IS INTERESTED IN YOUR SPIRITUAL WELL-BEING BECAUSE IT FLOWS OVER INTO ETERNAL LIFE, MORE THAN JUST OUR PHYSICAL WELL-BEING (Luke 12:23; Matthew 6:23). We were once approached by a brother from the U.S. who desperately needed a word from the Lord for his trying situation. As a family and ministry, we felt his hardship, so we asked the Lord for a word for him. The Lord revealed that the brother had NO FAITH, and did not pray, and he was told what to do in order to receive God’s blessing and deliverance. He did not come back to us after I sent him his message, and out of concern I made a follow-up but he still did not reply. A few months later, the Lord showed Charis in a vision that this brother was going through a tough time and he did not know how to ask the Lord for forgiveness; he was trapped in pride. If we would only humble ourselves and stop thinking that we can just use God when we need Him, and draw near to the Lord, the Lord also will faithfully draw near to us (James 4:8). In addition, I once invited a young man to our services; he came, and after the service he needed prayer for a job. I invited him to accept the Lord into his life (Matthew 6:33); this part he refused, but he needed prayer. We prayed for him and told him to make his life right with the Lord. He went off without his blessing, since he wanted to use God. The Lord told us that this young man does not love Him and he is interested only in the things he could get from God (Luke 10:27). We should be driven by love for God, rather than for the things we expect from Him. Also, some people use God to get to a boyfriend or a girlfriend. I have seen this many times; a man giving up his life in the Lord for a woman he lusts after, only to divorce bitterly later because he was driven by lust and not love. Likewise, there are ministers who are using the gospel to gain popularity for themselves: they do not witness, live holy lives, and rebuke sin. They expect honor from the congregation and the community, without love for God and the things pertaining to God. Some people who are not saved are instructed to give tithes thinking they will be saved from Hell (Mark 8:36). Let me tell you: this is using God for the wrong purpose. Still others hide behind the name God to make money; how wicked! The Lord is going to severely punish those who are using Him and His Word for wrong purposes (Jeremiah 23:34-36). Recently, someone in our ministry was rebuked by the Lord for quoting Scripture for evil purposes. He deceitfully quoted Scripture in order to smother or demand something from someone. He used God’s word for his greed. Let us, therefore, watch our motives when using Scripture. We must determine in purity if our motive is to bring glory to God, or to benefit ourselves. Vision given to Charis on May 12, 2014. As a praying family and ministry, being strongly led by love to reach out to our Ukrainian brothers, last night (May 11, 2014) we prayed in agreement asking the Lord to give a word of encouragement for the people of Ukraine. Below is what the Lord showed and Charis recaptured the illustration that the Lord used for your understanding. “When I asked the Lord last night when He visited me for a word for the Ukrainian people, He did not answer me immediately. I received this vision after our morning prayers which is at 06:30 A.M. 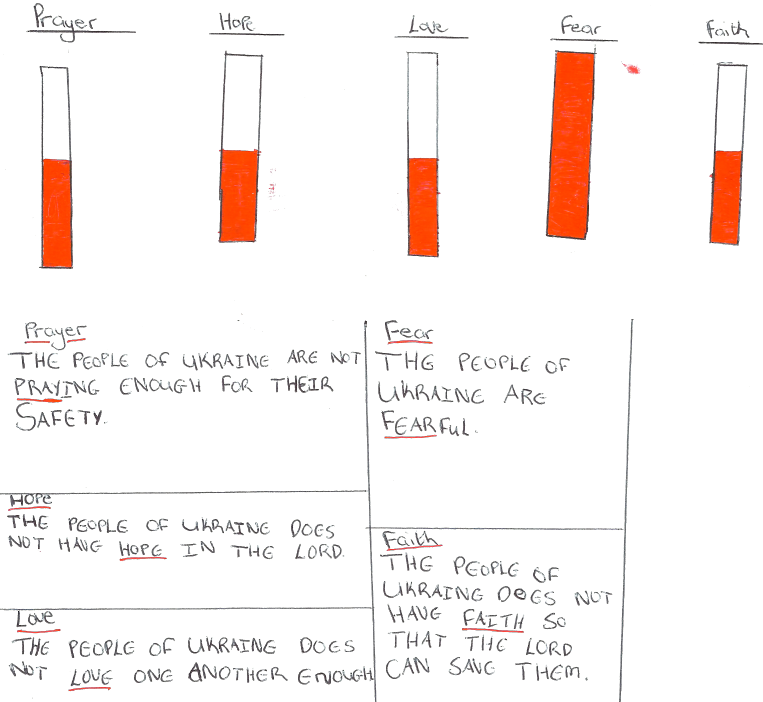 I saw the Lord lowering and He suspended in mid-air what looked like a thermometer that measures people’s temperatures with five (5) thermometers like in the drawings below. Prayer: The people of Ukraine are not PRAYING enough for their Country and safety. 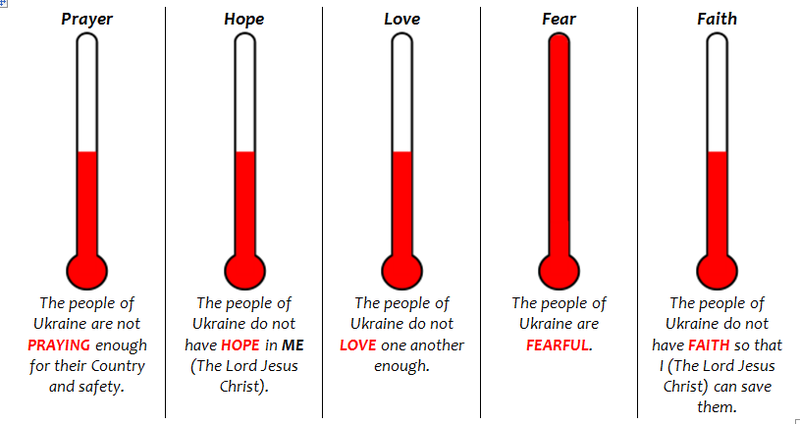 Hope: The people of Ukraine do not have HOPE in ME (The Lord Jesus Christ). Love: The people of Ukraine do not LOVE one another enough. Fear: The people of Ukraine are FEARFUL. Faith: The people of Ukraine do not have FAITH so that I (The Lord Jesus Christ) can save them”. Brethren, in the Almighty name of our Lord Jesus Christ and His compassion for the oppressed we beseech you to pray for the Ukrainian people and all those around the world who are going through trying situations. God bless the people of Ukraine with PEACE in Jesus name! For our Ukrainian brethren, pray for your Country while obeying the Lord in all His ways; your salvation is sacred!